For everyone who loves sweet, local strawberries and honey crisp apples, take heart in knowing that two of the farms that are major producers of the fruit have been forever protected. The Leelanau Conservancy signed agreements in December that will protect 380 acres and three farms. All of the land is within a six-mile radius; one farm has frontage along M-204 near Suttons Bay and the other two are in nearby East Leland. The largest of the three farms—and one of the oldest in the county–is owned by Gary and Christi Bardenhagen. 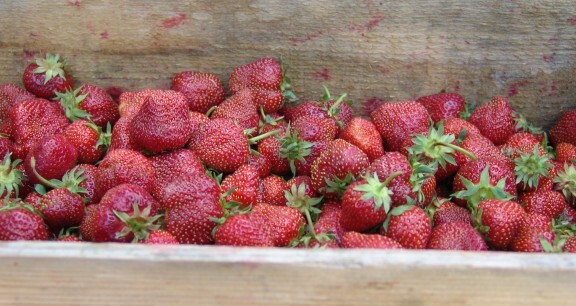 The 184-acre property produces the much-celebrated local strawberries that are sold at area markets such as Hansen’s and the Leland Mercantile. They also grow cherries and blackberries. Christi’s great-grandfather, Johann Bremer, homesteaded the land in 1865. The Bardenhagen’s son Steve, 38, who will take over the farm soon, is the fifth generation to work this hilly, beautiful land on Horn Road. “I’m excited,” says Steve. 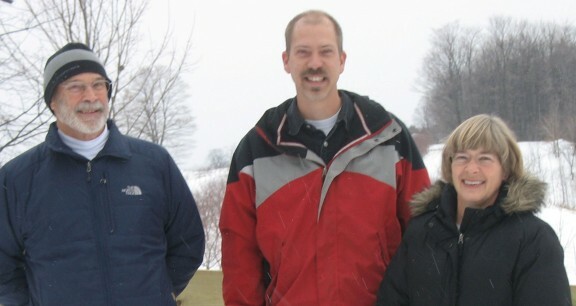 “It’s a great opportunity and what I want to do—to farm, and to make sure that the land is preserved for future generations to farm it as well.” Steve and his parents say they could not have made the generational transfer of land without the help of the Leelanau Conservancy and receiving compensation in exchange for agreeing not to develop the land. Basically, under such agreements known as “purchase of development rights,” farmers are paid the difference between what their land is worth for agricultural use versus what it is worth if it were subdivided and turned into residential development. Purchase prices paid for the development rights, representing 75 percent of appraised value in each case, were $3283 per acre for the Gary and Christi Bardenhagen farm and $2,900 per acre for the Jim and Jan Bardenhagen farm. “It’s a win-win,” says Gary. “We get income for our retirement and can now sell the land to Steve at a price per acre that he can afford and that we think will cash flow for him.” And the rest of us get to enjoy the wonderful fruit—and the scenic views–this farm produces. 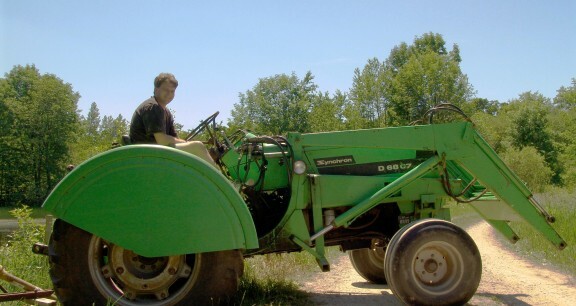 Funding for the Gary and Christi Bardenhagen farm project came in part from state and federal farmland protection funds obtained through the Leelanau Conservancy. Conservancy private donors, along with $27,464 in donations that had been directed to the now defunct Leelanau County Farmland Protection Program, made up the difference. The going price per acre for farmland in the county now (about $6,000) is a far cry from the days when Christi’s great grandfather, Johann Bremer, made the first generational transfer of the entire 184 acres for a mere $1,500 to his son, John. Bremer was a German immigrant who served in the Civil War. He homesteaded the land soon after, and built the old weathered barn and nearby farmhouse that Steve now lives in. One of the treasured artifacts of the farm is a framed contract of that first $1,500 sale from Johann to his son, John. Along with the money, Johann required annually three bushels of flour, 10 cords of wood, and fruit from 15 trees—to be selected by him. Johann also bound his son to care for his medical needs and keep his clothing in good repair until his death. The land then passed to Christi’s father, Edwin. It was her father’s dream, says Christi, that the land would always stay in farming. But it wasn’t until she had a family of her own that she considered taking over the operation. None of her four siblings were interested, but Christi and Gary were. They wanted to come home and discovered that the price her father had asked for the 184-acre farm was the same as buying a small piece of land and building a house. They signed a 20-year land contract and the farm was theirs. That was 1973. Gary took a job with a firm in Traverse City and they moved in to the old farmhouse. “We thought we would be able to run the farm on weekends, and in our free time,” she laughs. “We were so wrong.” After about a year, Gary had to give up his day job. Steve has followed a similar path. After earning an electrical engineering degree from MSU, he also left the area. But like his parents, Steve returned, drawn by the pull of the land. “He started helping us and gradually he’s realized that he wants to be here. He hasn’t looked back,” says Christi. Steve’s two children Nick (17) and Megan (11) are the sixth generation descended from Johann Bremer to work on the farm. The second farm protected via the sale of development rights also bears the name of Bardenhagen. Jim Bardenhagen, along with his wife Jan, owns and runs an 80-acre farm on Pertner Road where he and Gary grew up. Their two operations are just a few miles apart, which allows them to share equipment and work crews—and to carry on the long-established tradition of family helping family during peak harvest times. Like Gary and Christi’s farm, Jim and Jan’s place also has a rich history. The brothers’ great-great grandfather homesteaded the land about 125 years ago and his great uncle built the farmhouse. With its wide-plank floors and massive kitchen table, the house is a favorite gathering place for extended family. Jim’s path to farming parallels Gary’s. He, too, left the state after graduating from MSU with a degree in marketing and transportation. But 12 years later he came back to help his dad on the farm. Over the next several years he juggled farming and his job as extension director for MSU. During this same time, the family sold off 90 of its 170 acres—a move Jim regrets. Even though the land he sold is still in farming, he says he is now looking for more acreage to grow more unique crops. Jim’s 36-year-old son, Chris, also wants to carry on the family farming tradition. He and his young family live just up the road, and as a licensed mechanic, Chris services the farm machinery on the farm. He also helps to grow and harvest the sweet, tart and Balaton cherries, honey crisp apples, table grapes, currents, new potatoes, and just recently, organic free-range poultry. Jim says that Chris is challenging him to move in new directions. Chris is shifting more toward the growing and profitable organic market. The other 120-acre farm is currently known as the Spinniken farm on off M-204. 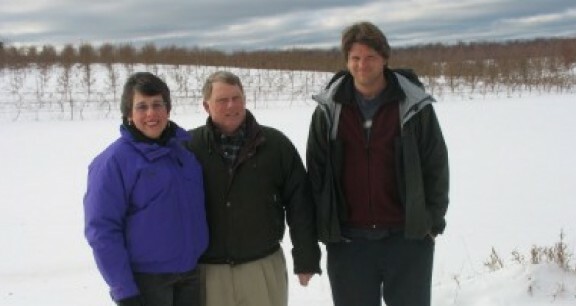 It was purchased by Roger Newton and his family, who live in Ann Arbor and hope to one day grow grapes on the land. 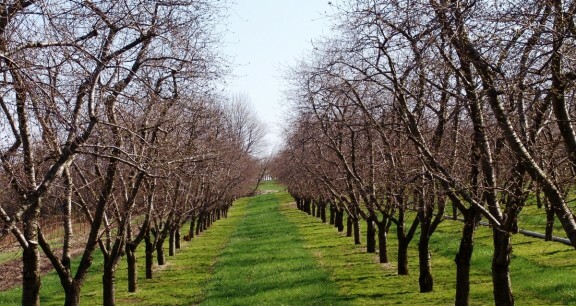 In the meantime, the Newtons are working with the Spinniken family to keep the current orchards in production, and gradually transition a portion of the land to grapes. The Newtons have placed a “conservation easement” on the land, which restricts the 120 acres to just two home sites. In return for their donated easement, which significantly lowers the value of the property, the Newtons will receive tax benefits. “My wife and I took a drive around different parts of the county last summer,” adds Newton. “We couldn’t believe how many large tracts of farmland were for sale. It shocked us and made us sad.” Because of the land’s close proximity to the new courthouse, Newton says he thought it was particularly vulnerable to development. But instead, Newton envisions that one day the hillsides will be covered in grapes, not houses. 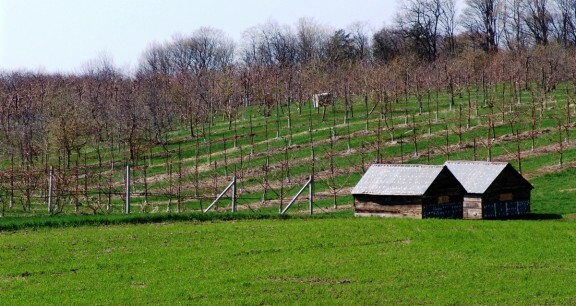 Because of its topography, the land is particularly suited to those red grape varieties that need a longer period of time to ripen, and could also be ideal for grapes used in making “ice wine.” Newton says he views grape growing as one of the long-term solutions to preserving farmland, because of the increasing demand for grapes. The Newton family has also preserved another 90-acre farm along Jelinek Road and work with the prior owner there as well to keep the land in agriculture. “We love Leelanau County,” says Newton, “and we feel best there than any other place in the world. 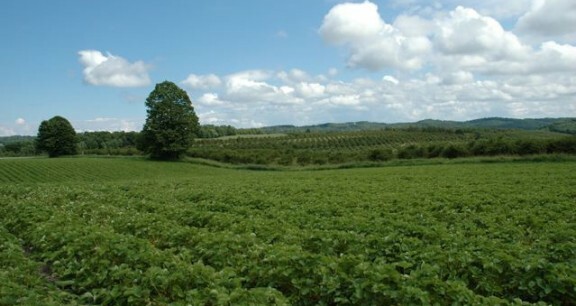 It gives us some sense of relief to have protected over 200 acres of farmland in two different townships.